Volunteers with Make the Road Action in PA celebrate Democratic wins at the organization's office in Reading on November 6th, 2018. 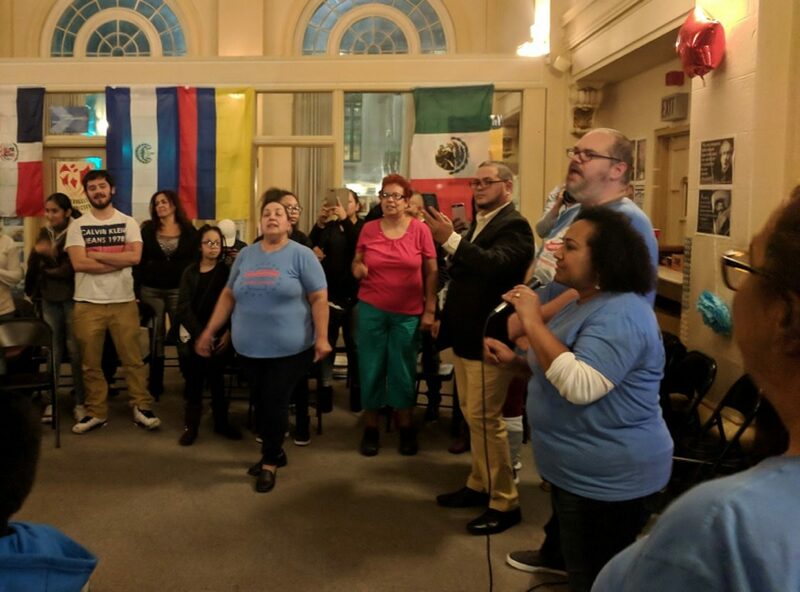 (Reading) — An advocacy group for Latino and immigrant rights in Pennsylvania is claiming victory in Tuesday’s midterm elections. The crowd at the Make the Road Action in PA offices in Reading burst into song at the news Democrats were projected to hold on to the governor’s office and a U.S. Senate seat. The activist group’s sister organization Make the Road Pennsylvania said it registered 7,000 new voters. Make the Road Action knocked on 240,000 thousand doors across the state. “But also to send a message to the Democrats that they need to respond to the needs of our people and that we have the power to organize and to defeat anyone in the polls,” Marin said. “We have mothers, parents who think about what they would do for their children, and I think that at the end of the day what the voters have decided is that these people should not be villainized,” Marin said. “They’re doing exactly what any of us would have done for our own children.